Valentine’s Day is coming and, as we are required by law, The Post is going to give you things to do on Feb. 14. But it would be irresponsible of us to further the myth that there is one Valentine’s Day. In fact, there are many, all of them dependent on a person’s circumstances and relationship status, all of them requiring different activities, sometimes dramatically so. With that in mind, we have come up with what to do with five very common, very recognizable Valentine’s scenarios that we will feature over the next five days. So, are you two exclusive; a couple? A fair question, but one neither of you is going to ask because you don’t want to seem clingy or needy or weird; plus, you might not like the answer. And it is at this very delicate point in the relationship that Valentine’s Day comes jackbooting its way in, demanding tangible signs of relationship definition. This must be avoided, and you decide how: You will kill it with fun. Begin at The Harbor which, as the name suggests, is a safe place to start. Romantic? Not as such, with sports on the many TVs, the light-drenched room, the energy from the street funneled through the open patio. Romantic? Not in any classical, saleable sense. But fun? Oh, hell yeah. Not only are there drinks, there are cheap drinks, part of The Harbor’s “Anti-VDay” event. There is $5 wine and select beer, $6 well drinks, $7 cocktails and this goes on from 4 in the afternoon until 9 at night because you are not alone. Of course, alcohol has been known to loosen tongues, cause dangerous proclamations to be made, so you will need to stay distracted. Fortunately, The Harbor is rife with games: darts, pool even skee ball. 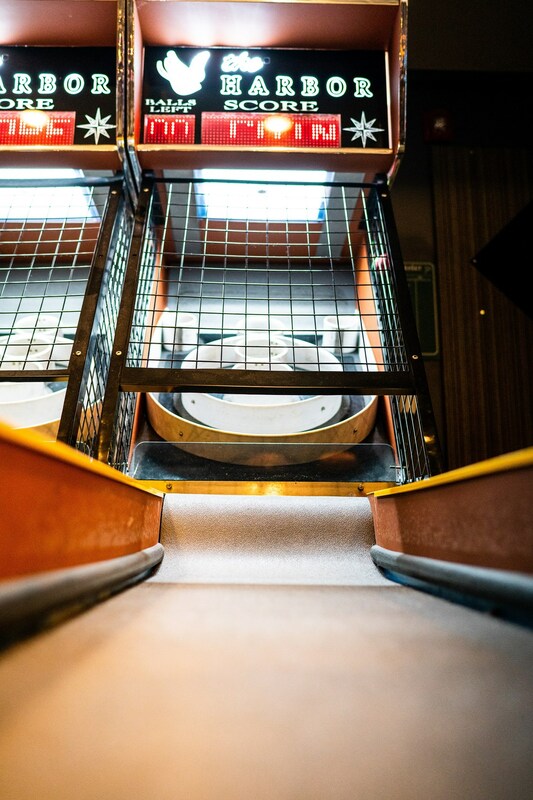 Skee ball! It’s so stupid. Perfect! The only thing that can ruin this is if you say something dumb, which you do when, while the two of you play darts, you believe it’s appropriate to tell them they are not the first English person you’ve dated. You then explain the other person was also from London but always referred to themselves as British. A sudden silence announces itself, not unlike the time they asked just how much Elliott Smith one person could listen to? A venue change is in order and you walk maybe 10 minutes east to The 4th Horseman, a new, raved-about restaurant with an interior that thrills fans of horror-core: tables adorned with cut-outs of old horror and sci-fi comics, shrunken heads lining the pathway to the restroom, monster posters and old-timey TVs playing nothing but static. Romantic? To certain types, absolutely. You two? No. Perfect! Your attention is drawn away from the two of you to every magnificent freak-drenched corner of the restaurant, then to the menu and pizza creations of mad scientist-chef Adam Schmaltz who believes anything can be a pizza. There are offerings with pastrami and kimchi and BBQ sauce and sauerkraut and, you think, if a chef can be this open to redefining something held so hidebound by so many, why can’t the two of you be free as well to define, or not define, your own relationship, if that’s what people need to call it? Things are really back on track, your track, so you suggest heading to Beer Belly for a nightcap. It’s just another short walk away but you won’t be drinking at the actual Beer Belly but the lovely secret it hides through a hidden door: a tiki bar. A tiki bar called, fittingly, Bar Tiki Tiki which has the requisite level of fun-ridiculousness, the mortal enemy of romance. 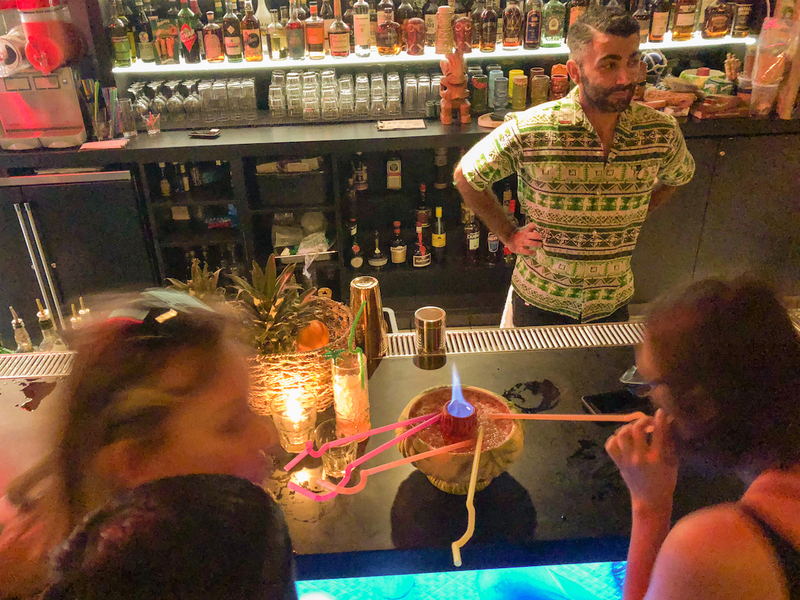 You choose from among myriad silly drinks called things like the Frozen Bird or Painkiller or Volcano Bowl and, as the latter suggests, many of them are served in large bowls that encourage communal slurping. This means the two of you can playact that you are sharing a moment of borderline intimacy—drinking from the same bowl—while each sip progressively deadens your ability to feel. Perfect! Again, a fair question, but one that you will not be asking.